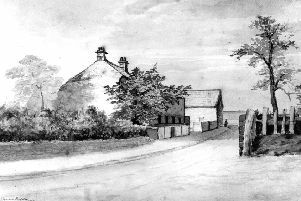 Coronation Row, in Monkseaton Front Street, was put up by Dryden & Company brewers in July 1821. The rose-covered porch near the centre, carrying the name-board ‘Comfy Home’ is identified as the one-time bow-windowed shop run by Sally Smith, known as Cat Sally, for her love of cats. Her little shop was a constant attraction for children who, for one farthing, could buy two enormous warm and fragrant black bullets. Miss Sarah Smith can be traced in the village between 1841 and 1865. By that time she would have been in her 70s. In June 1936 demolition work began on two of the cottages for an extension to the pub. Email discover@northtyneside.gov.uk with further details.